Les Pins campsite invites you to spend an unforgettable holiday in the heart of unspoiled nature close to Erquy's loveliest beaches. 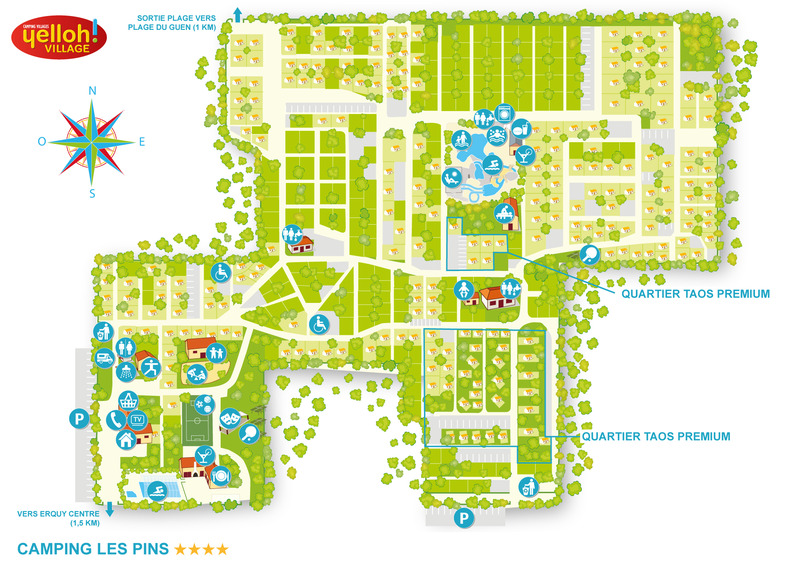 We offer high-end rentals and pitches, quality services and a 1000m² heated aquatic park. The covered swimming pool and waterslide pool will be favourite fun areas for your family holiday. Your children will love the Kids' Clubs where they will discover all sorts of new activities. Would you like to go camping in Brittany? Then book your stay at Yelloh! Village les Pins and you're sure to have a wonderful holiday for the whole family! The spa D’O wellness centre for some real relaxation, featuring hammam, Jacuzzi, sauna, massages, beauty treatments and more! A seaside campsite for energetic holidays: windsurfing, sea kayaking, catamarans, diving and more! Clean, tidy, comfortable chalet. staff were very friendly and helpful. peaceful location and good facilities. Really good super site lived all of it. Great village, friendly staff, all around great park. Come to the campsite in Erquy and enter one Brittany's most enchanting, legend-filled regions. Les Pins campsite is surrounded by exceptionally beautiful sites and landscapes such as the magnificent beaches and inlets along the Penthièvre coast where the clear blue sea meets the bay's awe-inspiring cliffs. Further to the north, you can admire the breath-taking vista from Cap Fréhel. Go back in time when you visit Fort-la-Latte fortress, built during the middle ages. You will have a wide-open view of the sea from the top of the fortified walls. Continue toward the east and follow the coast to Dinard. The best way to visit the city and the surrounding area is to take the "Promenade du Clair de Lune", a footpath along the cliffs and beaches. Admire the lovely British-style homes that bear witness to the city's wealthy past. Don't wait any longer to spend your camping holiday in Erquy; there are so many places to explore!